How will Saskatchewan residents be celebrating Thanksgiving this year? For the most part, most of Saskatchewan will be celebrating Thanksgiving 2018! 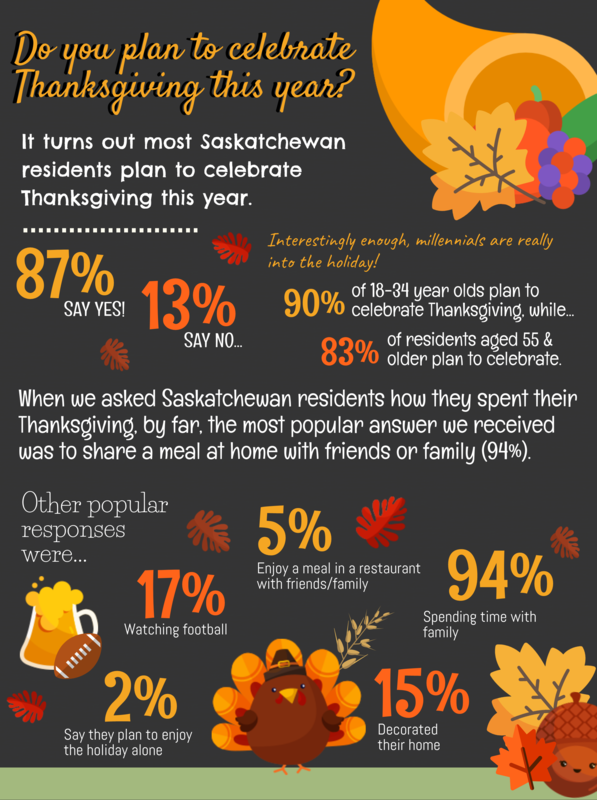 We ran an OnTopic® survey between September 17 – 20, 2018, with members of our SaskWatch Research® online panel in all parts of Saskatchewan to find out how residents of the province plan on spending their Thanksgiving 2018. We found out that most residents of the province (87%) plan to celebrate Thanksgiving in some way. We also learned that more women (90%) than men (84%) are planning to celebrate the holiday. Age seems to have some bearing on Thanksgiving plans, as well. Interestingly, more young residents are planning to celebrate Thanksgiving in 2018 than older residents of the province. Nine out of ten (90%) residents aged between 18 – 34 years old stated they plan to celebrate their reasons for being thankful – a full 7% more than those aged 55 years and older (83%). Less statistically significant, but still worth noting, 89% of those aged 35 – 54 reported they also plan to celebrate a Canadian Thanksgiving in 2018. How will Saskatchewan residents celebrate Thanksgiving 2018? By a great margin, it turns out that Sask. residents really enjoy eating with their loved ones over Thanksgiving. More than nine out of ten (94%) respondents who said they planned on celebrating Thanksgiving in 2018 reported that having a meal at home with friends and/or family was the way they plan on celebrating the holiday in 2018. While Thanksgiving dinner was by far the most popular planned activity in 2018, Sask. residents who said they plan on celebrating the holiday also said they plan to watch football (17%), decorate their homes (15%) or enjoy a meal out at a restaurant with friends and/or family (5%). Only 4% of those who plan on celebrating this year said they plan on decorating their places of work, 3% said they had other plans entirely – and 2% said they plan on enjoying the holiday all alone. What will Saskatchewan residents eat for Thanksgiving 2018? Now that we know that eating with friends and/or family is on everyone’s mind this year, let’s look at what Saskatchewan residents who plan on celebrating the holiday will be sitting down to at Thanksgiving dinner in 2018. Not surprising was that 85% of them stated they plan to go back to that tried and true Thanksgiving champion – turkey – for Thanksgiving dinner. This may be a case of not fixing what isn’t broken, as many of those reliable Thanksgiving dinner sides were also mentioned. Seventy-six percent (76%) stated they plan on enjoying some stuffing for dinner, 74% said they were looking forward to having gravy and 74% said they want to get some mashed potatoes in, as well. Pumpkin pie is looked forward to by 71%, and 45% anticipate cranberry sauce in their future. Dinner rolls are also looking like a popular choice (43%) and almost four in ten (39%) plan to partake in some ham rather than the more popular Thanksgiving turkey. Apple pie is once again dominated by the choice for its rival, pumpkin pie – only 29% of those who plan on celebrating Thanksgiving plan to eat it this year. Sweet potatoes are something that one quarter (25%) look forward to, 8% plan to eat wild game and only 2% are planning to choose fish for Thanksgiving dinner. 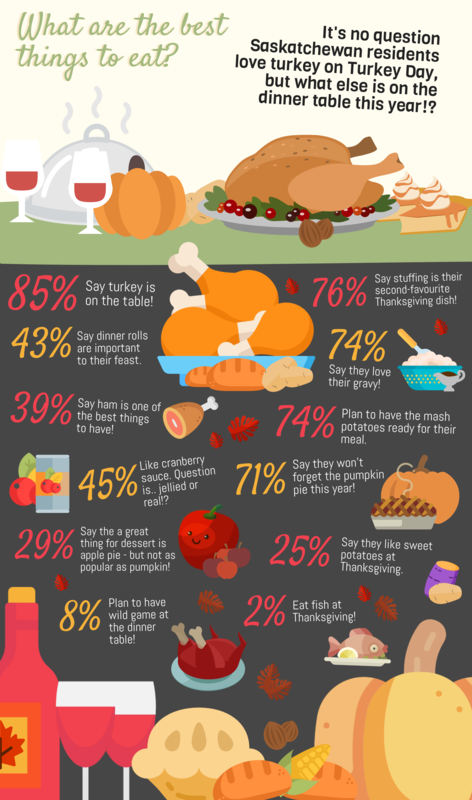 More than one in ten (11%) of those who plan to celebrate Thanksgiving plan to eat something else entirely. Check out the word cloud below for some of these Thanksgiving dinner choices (responses depicted larger were more popular and smaller ones were less popular). 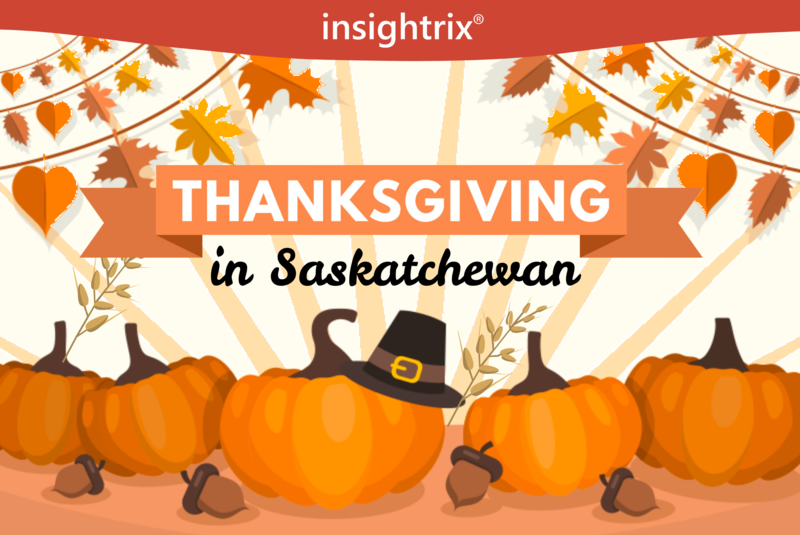 It looks like Thanksgiving remains something that many Saskatchewan residents look forward to and plan for – and younger residents seem to be embracing the holiday more than their older counterparts. Thanksgiving dinner is the most popular planned activity to celebrate the holiday by quite a large margin, but Sask. residents also plan to watch football and to decorate their homes. We also learned that traditional choices beat out more unconventional ones when it comes to Thanksgiving meal planning in Saskatchewan in 2018. Pumpkin pie and turkey are still the people’s champions when it comes to Thanksgiving dinner choices, beating out apple pie and ham by quite a bit. There may be something to not fixing things that aren’t broken after all. Do you want to participate in fun and interesting research like this? You can! Register with SaskWatch Research® today and start participating right away. SaskWatch Research is Saskatchewan’s largest online research community, comprising over 18,000+ Saskatchewan residents from all over the province. When you become a SaskWatch member, you’ll have the opportunity to weigh in on important issues in Saskatchewan, and have your voice heard on concerns related to brands and businesses.